Approximately 300 people including scientists, engineers, and other experts, about half with doctorate degrees, have petitioned U.S. House Science Committee Chairman Lamar Smith (R-TX) to carefully investigate suspiciously overheated climate temperature book-cooking by the National Oceanic Atmospheric Administration (NOAA). NOAA’s adjustments to previous ocean temperatures between 1998 and 2012 made recent global temperature changes appear more than twice warmer than the original records showed. This was accomplished by throwing out global-coverage satellite-sensed sea surface measurements taken since the late 1970s — the best data available — and upwardly adjusting spotty and unreliable hit-and-miss temperature readings taken from ocean-going vessels which present well-recognized problems. Big errors are introduced because readings taken from the cooling-water intake tubes of various ships record measure temperatures at different ocean depths. Varying amounts of conduction from different vessel infrastructures and daily sun conditions skew temperatures as well. Writing in the well-known science blog “Watts Up With That,” CATO’s Center for the Study of Science Director Patrick Michaels, Assistant Director Paul Knappenberger, and Distinguished Senior Fellow-MIT Professor Emeritus of Meteorology Richard Lindzen agree that the lax standard of NOAA’s study should prompt questions by members of the scientific community. In addition to tweaking recent temperature readings to be higher, NOAA’s revisions to earlier original data have consistently made past temperatures cooler. As climate expert Bob Tisdale and meteorologist Anthony Watts observe on the same WUWT blog site, “To manufacture warming during the hiatus, NOAA adjusted the pre-hiatus data downward” to show even more recent warming. Incidentally, NOAA’s “corrections” to suggest warming between a huge 1998 El Niño and another big one last year contradict data provided by other wider-coverage and higher quality measurements. A large integrated network of Argo ocean buoys operated by the British Oceanographic Data Center in combination with satellite-enhanced data reveal no statistical warming. 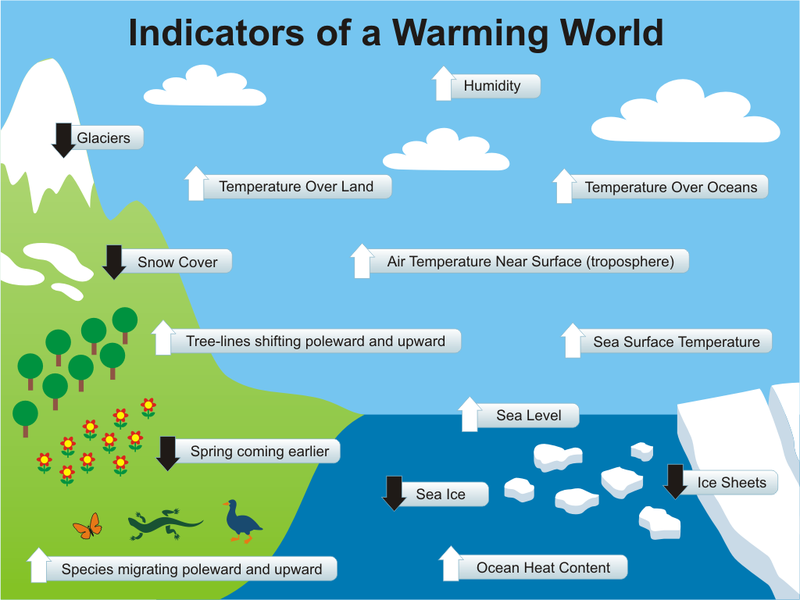 And even if all those adjustments were right, the warming trend would still be significantly lower than was projected by the collection of climate models cited in the most recent U.N.’s Intergovernmental Panel on Climate Change (IPCC) report. In light of the massive El Niño there should be no surprise that 2015 showed elevated temperatures — about a quarter of a degree Fahrenheit higher than the previous year. This is similar to what happened with the El Niño in 1998. Also don’t be surprised to see it soon followed by a La Niña cooling. Although not well understood, there is no evidence linking these naturally occurring reversals of Pacific trade winds and deep-ocean currents to any man-made influences. Michaels, Knappenberger, Lindzen, along with most of us, recognize that global temperatures have been warming in fits-and-starts since the “little ice age” ended in the mid-1800s. House Science Committee Chairman Smith has expressed a commitment to look into concerns that the real purpose of NOAA’s report was to push President Obama’s political agenda. He is not alone in noting that the non-peer-reviewed study appeared to be rushed for release conveniently in advance of UN Climate Change Conference held in Paris last December. After all, isn’t serious scrutiny a prerequisite for all trusted science? ” but even if the adjustments are right”. the moon landing story next? We understand your message: trust blindly and never question. Good sheep. You are blindly trusting that them thar daters been adjusted with no information. What about the presumed conspiracy by oil companies? One conspiracy cancel the other… Try again with something plausible. Thanks Dr. Bell, great post. All scientists should show their work and that goes double if they received government funding. ” climate expert Bob Tisdale “. Is there an allegation of error? Nobody is ‘tampering with stats’. Smith was personally given all the data. Twice. And it has always been in the public domain. So nobody cares what a little list of non-climate scientist, paid shills, exposed frauds have to say about a settled matter. Oh, when was this changed? You always claimed it was normal practice. Dano2, wrong: old data -kept in wayback.com files- show old records have been changed towards cooling. Local files from almost all over the world show an upward “correction” with no plausible explanation for the correction. You were duped. Why are denialists so easily duped? Thats a damn good question. come up with and propagate. Usually in the form of conspiracy theory. so it bears the best resemblance possible to reality. i think we both agree about this. its ALWAYS very badly done. No, there shouldn’t be science on both sides of the aisle. Science should produce the facts. But to produce the facts they have to be above reproach. The scientists and engineers have rightly pointed out the flaws in the reports and questions why the report was rushed instead of being peer reviewed. of no peer review substantiated. Is Karl et al 2015 peer reviewed or not? You made this up: he flaws in the reports and questions why the report was rushed instead of being peer reviewed. “A few years back and again recently, I saw some of NOAA’s manipulations myself, as I compared data sets from one version with the next. The more recent versions had 9999 in some places where there used to be a value. I didn’t have to examine many stations to see they have been systematically deleting selected high readings, which their software then infills with averages of the rest, et voila! the past just got cooler. They have been doing this with each version. Their first couple excuses were almost plausible. Now, if the data don’t say what they want, they get rid of that data, because they know what good data must say. They don’t bother with excuses because they are “the authority” and that’s the only source you’re allowed. The sad part is that so few even realize that for identifying heat content of the atmosphere, the data are meaningless no matter what they are tortured into telling. Apparently nobody teaches science anymore. Oh, I know, I know: LoWatts found another conspiracy and it validates your self-identity. We know how it works. My research was made back in 2004 when Watts was totally unknown in the web. Another of your bloopers… So… you know how everything works… 😀 Then I will ask you to forgive my arrogance. I didn’t know you were the sole owner of the Enlightened Truth. So it is your conspiracy ideation. Congratulations on injecting a new conspiracy into the denialosphere. Oh, wait: research. Where is it published? On that website since 2004, but you haven’t seen it, of course. It has been under permanent public AND peer review –and NO ONE ever refuted it. Where do YOU publish your rant? Drano, stop drinking Cool Aid. It shrinks your brain and people notice it. So no real, peer-reviewed journal. Got it. This a kind of study that cannot be published in a printed magazine… it sould need the entire magazine for showing 1583 temperature graphs and the comment on each one. As I said before. Cool Aid has shrunk your brain to AGWers size. BTW, where are YOUR papers? Right, no not a real study. We get it. BTW, my papers are in several journals of the natural sciences, a half-dozen proceedings, and every trade magazine available for practitioners of two trades, thanks! Good! Any link so we can check if you’re not simply a warming liar/troll? So I can be hounded for years? Sure, why not? Ok… now we know. You’re a troll. Dishonest assertion. Likely to hide the fact you didn’t make a real study, despite your assertion upthread. You are an amateur. A lousy one by the way. Dodging the main point of where are the links to your “published studies” is an attempt of diverting the attetnion away about you having no work published. My study is for REAL, you have it in the web, and millions of persons have looked at it since 2004. I don’t know a person that has read any of your inexistent “studies”. Again, you reveal yourself as a troll. Your aggressive bombast doesn’t do anything for me, except tell me you have nothing, standard con knee-jerk reaction. You don’t remember me; I’ve crossed you in others forums, but under a different nick and I have beaten you any time you opened you mouth. But now you are really pissed off by having been exposed as a troll and a fraud. No hand waving can deny that. My job is done once more. Drown in your own venom. and I have beaten you any time you opened you mouth. Using the same weak, trite rhetoric as here? Doubtful. BTW, your weak bluff you having no work published. Is weak. A non-weak person would understand anonymity. No reason why the weak from you. “study” all you want. Just make sure it agrees with observations. If not then your silly computer model isn’t worth a jot. And since none of your silly models agree with observation then they are ——Not worth a jot. You made that up. You can’t support that statement. such a sequence of words. Let us know when you develop a different standard for science. Oh, wait: you are just whining because science doesn’t validate your self-identity. Never mind. It must be so difficult publishing when the climate Taliban are determined to stop you publishing. I seem to remember one of the incriminating emails (the ones where the activist scientists were all cleared of any wrong doing hahahahahaha by committees of vested interests) stating that they would go so far as to redefine peer review in order to keep certain papers from appearing in scientific journals. Nasty business this “science” isn’t it? —–But then again it’s all down to personal taste what? As opposed to the single purpose IPCC seeking all the time to prove what they were set up to prove. That is their remit after all. When you set out to prove what you already have in mind you are indulging in activism not science. And your legion of ideologically pure, free merkit scientist? What do they say? So you have no science that validates the ideology either. We know. Remember you are the one who “believes” something. It’s only possible that you are the one being “duped” therefore. Read the article Dano. The data NASA/NOAA used was substandard. So it doesn’t matter they supplied the data, the error is that they did not use the best data available. Even if the error was identified by non-scientist, consider other sciences where everyday citizens fly against the experts (environmental issues especially). The letter was written by a wide range of scientists and engineers, including those involved in climate change. And it doesn’t take a climate change scientist to identify when NASA/NOAA are manipulating data to support a hypothesis instead of using the scientific method where data either prove or disprove a hypothesis, if disproven, a new hypothesis must be developed. I tend to lean toward climate change, but not the hysteria of the Obama administration. But I also want scientists to hold true to their craft, to follow the scientific method, and to not manipulate data. Smith has all the data, thanks! “Settled”?? Settled science is an oxymoron. “Settled” refers to political agreements and religion, it is the opposite of science. Anything that is settled is not science. No it’s not. The cause of gravity is a hypothesis. So true, space time distortions are little comfort when scraping up a dropped jar of marmalade of the floor. Gravity is a fact. It used to be explained with Newtons theory, now it is explained with Einstein theory. Someday it will be another theory. That is how science works. Religion and politics are “settled” by consensus. Science does not work that way. Thank you – I was using your flawed logic to make a point. Gravity (c/A/Planck mass) is settled. Consensus science is not science. I can see you are not a scientist. I am by the way, 42 years experience. Facts are not science. Science is a process. Facts are observable things, like gravity. Do not confuse gravity with the theory of gravity. Do not confuse global warming with the theory that man caused it or the speculation that global warming will be a problem or a catastrophe. Global warming is a fact, CO2 is a greenhouse is a fact. That global warming will cause death and destruction is a very speculative hypothesis (not a theory) with no basis in fact. Just some computer model runs that have yet to predict anything, much less a catastrophe. I can see our scientific education in the US is very flawed. Indeed our scientific education in the US is very flawed if purported “scientists” state inanities like That global warming will cause death and destruction is a very speculative hypothesis (not a theory) with no basis in fact. Just some computer model runs that have yet to predict anything and making ludicrous assertions such as “Dr Bell”. As this author, and the scientist, indicate the level of global warming may be much lower than purported by NASA/NOAA. Worse, NASA and NOAA, are manipulating data to support global warming claims. There is repeated instances where scientists “fudged” data to meet their hypothesis. So not only is science education lacking, ethics is near non-existent. You made this up: Placement of the temp. recorders is cherry picked to show the desired results. A few years back and again recently, I saw some of NOAA’s manipulations myself, as I compared data sets from one version with the next. The more recent versions had 9999 in some places where there used to be a value. Their “data” are State sponsored agitprop. Says some commenter on a blog. If it’s not published, you aren’t believable. It wouldn’t matter if it were published by me or anyone else. Your “mind” (stretches the term a bit) is made up. You are one commenter on a blog as well. But being “believable” is not the issue. Feel free to “believe” whatever you like, if “believing” things is so important to you. So we are not looking at facts, but fabrications or alternate facts. Actually faith(religion) is settled by revelation. We see examples of gravity everyday. Like when I fall of my stool laughing at the likes of you. The only place your likely to see global warming is in a computer model. Why are we concerned about climate change when the big problem is PEAK OIL ! Do you remember the big scare about peak oil? You really must be kidding. To say that federal science agencies are “transparent and accountable” is hilarious. Anything about climate that comes from the Ovomitscumbagasshole Misadministration is tainted with lies from the get-go. Lying is just about the only thing accomplished by this grossly incompetent bunch of hacks in DC under this Misadministration. you havnt named what that something is. The context strongly suggests Karl et al 2015.
the subject of your writing in your writing.